CuZn’s KR-101N, KR-101A & CR-1 Wide Spectrum Cartridges all utilize the powerful combination of KDF/GAC Filtration Medias. 20,000 gallons of city water, spiked with high levels of specific contaminants, was run through a KDF/GAC cartidge. The efficiency shown below was measured AFTER 20,000 gallons had passed through the cartridge (when new, removal is 99+%). Most other non-standard tests show results after only one pass of contaminated water, which does not indicate how the filter will perform towards the end of its life. To pass the NSF-53 protocol, the effluent must be under the EPA Maximum Contaminant Level (MCL) throughout the test. All concentrations are measured in milligrams per liter (mg/l). 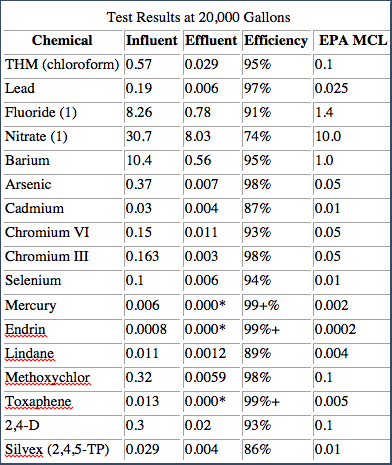 (1) – While this test shows a reduction in these contaminants, Fluoride, Arsenic & Nitrates, CuZn has found that filtration efficacy can be inconsistent in their removal in certain water conditions. As a result, we offer & recommend the use of CuZn Nitrate (model#NR-1), Arsenic (model#AR-1) and Fluoride (model#FR-1) specialty filters be used in tandem with CuZn Wide Spectrum Filters when these contaminants are present. A separate test was run on another KDF/GAC cartridge to determine chlorine removal capacity. The challenge solution contained 3 mg/l chlorine (most cities use less than 1 mg/l). 2 mg/l lead was also added. At 20,000 gallons, both were being removed 99.9+%. The test was terminated at 28,400 gallons when the chlorine removal rate hit 90%. The lead removal was still 97.6%.